Walmart, world's largest retailer, sells wide range of products and services. Most of the Walmart Stores also have extensive photo departments. However, only few Walmart stores offer Passport photos. Also, they offer only USA Passport photos which are 2x2 inch. They do not offer photos for other countries, like 35x45mm for Australia, UK, Germany, France, New Zealand etc., or 33x48mm photos for Chinese Passport or 25x35mm photos for Indian PAN card. If you need digital images for Lottery Visa or DS 160, Canada Visa or India OCI, we can help you with your needs. Also, we provide 6 passport photos instead of just 2 photos for the same price. We are the Walmart when it comes to passport photos online. We are leader for low prices online. We offer 6 photos (any size, any country, for Visa or for Passport) for a price as low as $7.95, and you can pick up at your local WalMart usually within same day. 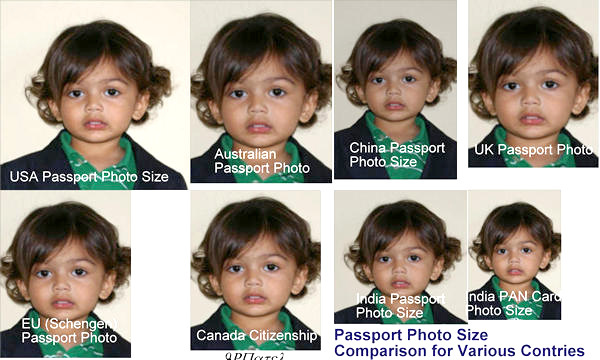 There are some online passport photo services but their automated tools do not fix or enhance your photos. Having seen photos of thousands of customers, we know that 95% of photos have issues like red-eye, shadows, non-white-background, tilted head, reflections of flash on glasses. We are among the few businesses that will manually fix all these problems to get optimum exposure in your finished photos. No surprise photos created by us have more than 99% acceptance rate. Click here to see what our customers say about our quality and service on our Facebook page. Best of both worlds! If you need passport photos urgently, we can arrange a pickup at your local Walmart store within USA and Canada(or at any Walgreens, CVS, Target store around you within USA). With your digital camera, take a half-body photo of yourself. Then Upload your photo and make a payment with us. Include your local store address on the order. We will fix and format your photos and send them to your local store for printing normally within few hours. We will provide you details in email about the pick up so you just need to go to the store and pick up your photos. Thank you very much Passport Photos. I was ecstatic when I saw the prints. I had my doubts the first time I came across your service but you have exceeded my expectations. You turned my ordinary digital snaps into professional passport photos and in record time. You are one of those rare online services that stands behind your word! Recently I have placed an order with onlinepassportphoto.com, I must say it was a very smooth process. They are very fast at responding to your inquiries, or if you wish they can answer your questions on phone. So the experience I had with onlinepassportphoto.com was outstanding. I say this because in the past, I have gotten many passport pictures and they were very poor quality. In my opinion,this website is the best out there,no one will be able to beat their service or price. I assure you,you will receive wonderful passport pictures! Want to have your local Walmart store take your photos? Go to Walmart Website and click on Store Finder by entering your Zip. It will bring your local stores. Click on the store near you and it will bring the info that includes if they have the photo lab in the store (most Walmart stores have it). If they do, they will also have the phone number. Call them and find out if they take Passport Photos at your local Walmart before you go down. Also, it can save some time if you make sure what hours the store's passport photo expert works so you don't have to wait when she is out on a lunch break. We have never seen any passport photo coupons or promotional codes at Walmart stores for passport pictures. Walmart also offers digital camera prints in minutes at the store. You can order 4x6 inch prints, 5x7 inch prints or 8x10 inch and many other sizes. Please make a note that Walmart Photo prints 4x6 photos that are uploaded online only on Matt paper. Most retailers print only on glossy papers except Costco which offers an option of Luster paper as well as Glossy paper. US Passport photos do not specify what type of paper to use so you will be fine whatever paper Walmart uses. If you are doing your passport photos yourself for some other country, please make sure they do not require Glossy paper. Also, most Walmart stores have self-service kiosks for scanning and printing digital photos, besides their professional photo printing machine. The difference in quality can be noticeable so if you want better quality prints, ask the sales associate to print photos on their 'big' professional photo printing machine. If you are uploading photos online for pick up in the store, you can also use their convenient SMS facility. You can put your cell phone on the order and Walmart will send you an SMS when photos are ready for pick up.